You get 364 days a year to live with purpose and meaning. On your birthday you also get to have fun! Wishing you a day that is specially designed by the Lord for you. May you find happiness in the simple things of life. Have a nice Birthday. May God bless you. May today be a very, very special time of blessings from family and loved ones. Happy Birthday. HAVE A BLESSED BIRTHDAY AND EAT LOTS OF CAKE AND HOPE YOU GET ALL THE GOOD STUFF! LOVE YOU LOTS. You are the miracle that God chooses to show us. Happy Birthday. You are a blessing and gift from God to us all. Please enjoy your birthday. I’m so proud of the person that you have become. And I know that God is going to continue to do great things in and through you. Happy Birthday. God helps those that help themselves and those who celebrate more birthdays live longer. Happy Birthday. May God always enlighten you and be with you on your way and that you never be in the way!! Happy Birthday. I hope you find even more purpose and meaning in your life in the coming year. God is so wise that he never created friends with price tags. If He did, I wouldn’t have been able to afford a precious friend like you. May you enjoy the Lord’s presence today. Happy birthday man. Have fun, God bless. Life is a journey and God is the destination. Let’s celebrate the day when you began your journey to reunite with God. Happy Birthday. I am wishing you a birthday filled with the brightness of God’s love for us. Your life is important enough for him to sacrifice for you. May people bless you on your birthday. May the good will of others shine upon you, and may others be gracious to you. May you have peace. Bless you on your birthday. My wish for you is to be happy,enjoy life,follow God’s will in your life, and that you have continued success in all you do. God bless you and your family and friends!!! Your birthday is a reminder to your family and friends that you are a blessing from the heavens above. Happy Birthday! Happy Birthday! May all your wishes come true and may God always take care of you. You are like an Angel sent to provide blessings upon us. Happy Birthday! Happy Birthday. Thank God for seeing you through till this day. May God’s grace and blessings follow you always. Wish u a very happy birthday,may god bless u with lots of happiness & success in the world. Happy Birthday! May God bless you with lots and lots of happiness, love and prosperity on your birthday & every day. Happy Birthday. I wish you all the very best, all the joy possible and may you be blessed abundantly today, tomorrow and the days to come! Happy Birthday & thank God for the amazing years you have had so far and I pray for even more happy, healthy, and fulfilling years to come. I hope you have a wonderful day and many blessed years to come! God Bless you and your family! HAPPY BIRTHDAY !! God knew you before you were born, and He had great plans for you. I believe He still has many more great plans for your life. I want to wish you a happy birthday, and I will continue to pray for your life to be a light to the world. If prayer kept you looking and feeling younger, then there would be a lot of people at church on their birthday. I thank God everyday for your presence in my life. I am truly blessed with a wonderful friend. Happy Birthday. May God guard you & protect you from all evil on your birthday & every day. May god and all the angels in the whole wide universe bless you with many more years! Oh yeah, I do love you baby, baby, baby. Happy Birthday. Happy Birthday to a beautiful blessed lady. You will always be in my heart. May God keep shining his grace on you. The Lord has known you since before you were born. That’s even further back than we go together! You’re the kind of friend that only heaven could have sent. God is not up in the sky but he is inside of you. So get some birthday cake for the both of you! Happy Birthday. May God’s awesome blessings Be upon you this day And for the future years ahead, May His blessings never fade In every area of your life, May God abound much more, So you may be a fruitful vine With the abundance of the Lord. I am praying that you are aware of your great purpose as you think about your own birth. God has called you to be his own, and there is no greater birthday gift than that. May you be blessed with wonderful times ahead and many happy returns for the day. Happy Birthday. Happy birthday! Have a blast! May God Bless you. May your wishes come true & all the best in everything you do! May god and all the angels in the whole wide universe bless you with many more years! Happy Birthday. Never feel ashamed about your age, for the Lord has always been and always will be. Your age is nothing to Him. Happy Birthday to you! I pray God gives you strength and good health to enjoy the rest of your many days. What a great blessing you are, and I am thankful for you, and celebrate you! Happy Birthday! As the body awkwardly ages, the spirit grows with grace. Wishing you a very Happy Birthday dear ***. May the Holy Spirit send you the gifts of wisdom, maturity and understanding. Let God’s hand descend mightily upon you to bless all that you are and that you do. Happy Birthday! I said a little prayer that you would have a happy birthday. Let me know if my prayers are answered. May God bless you for many more and may you stay the sweet person that you are!! Happy Birthday. May you be blessed this next year in special ways at just the right time. I hope your first blessing is a great birthday. Getting old is hell so make sure to save some cake and ice cream for God. Happy Birthday. May God bless you, Today and every day, In everything you do And in every little way May you also know His love is all around As you come and go, May His blessings abound. God decides what he wants and you are here to celebrate your birthday, so God wants you to celebrate. Do it. You are always the perfect age to be used by God. May God continue to shine his grace on you and carry you through. Happy Birthday. May God continue to bless you life and give you the desires of your heart. To God be the glory as you add another year. May God grant you wisdom, knowledge & understanding. Happy Birthday! You were wonderfully and beautifully made for His purpose. Birthdays come and go, but the Lord’s love for you is everlasting. My birthday wish for you: may God uplift you more, may God richly bless you with everything you desire the most, may God increase you in wisdom, may God continue to watch over you always, may God continue to use you to change lives, may God shower you with blessings and may God give you the best in life. May God grant you the strength to blow out all those candles on your cake. Time doesn’t exist to God, but your birth into the kingdom of heaven was an important moment to Him. Your Earthly birthday was important as well to all of us who love you. May God bless you and keep you always in His tender, loving care. Birthdays are a great time to remember that God creates some beautiful people. You are one of the best I know. May all your future plans be blessed by God and fulfilled by you. Happy Birthday! May you feel loved by your creator and all the other people who care about you. I pray and wish a good health for you. Continuous wisdom and knowledge to guide you. Happy Birthday. Happy Birthday! May you be blessed with health, good luck & happiness all year long! Wishing you the best. I don’t know if it is your birthday or if you just sneeze a lot, because God certainly blessed you. Happy Birthday. May God continue to bless you every day with health, love, happiness, and the best life has to offer. Happy Birthday! May you see God in every step you take and know which direction to go to find happiness. Happy Birthday. Happy Birthday. May you be blessed with happiness today, tomorrow and always! I’m glad you were born into this world, but I am even more glad that you have been born again into the Spirit. I am praying that God fills your life with His love on your birthday. Happy Birthday and may God bless you in your endeavors. I hope that your day is blessed with happiness and joy. A special prayer for you that the Lord will bless you on your special day. Even though I want you to, you may or may not have a happy birthday. One thing I know is that you will have the peace and the joy of your salvation. There’s no better gift. Happy Birthday! May God grant your hearts desire by giving you the winning numbers so that you may win the lotto. May a special blessing touch your heart in every way. Happy Birthday! As the dawn breaks through And another day unfolds, May it offer you real hope In what the future holds I pray this day for you Is all you want it to be And your hopes and dreams will soon Become reality. May the Almighty grant all your heart’s desires,remain the way you are. I couldn’t have asked for better son/friend than you! Have a Happy Happy Birthday! On this your birthday may you be filled with laughter, joy and peace with your family and close friends content in all life brings. Through the years, in faith, may you strengthen lives and bear much fruit Bring great glory to our God On this your birthday know you’re loved! Happy Birthday. May God Bless you. Keep smiling & have a nice day. I wish you all the happiness in the world. May God bless you with Love, Happiness, Family & Friends. HAPPY BIRTHDAY !! I consider myself blessed to have a friend like you. Your birthday was a gift to me. May your year be radiant with God?s hope & Rejoicing with you on Your Special Day! Happy Birthday! Happy Birthday. May God shower you with blessings. May God open up doors for you and then some. Delight yourself in the Lord and He’ll give you the desires of your heart. I know, He made you just for me. The best is yet to come! May this day bring countless happiness and endless joy and live with peace and serenity. Happy Birthday. It’s easy to see that your birth is part of God’s master plan. He is using you for a great purpose. I wish you a great birthday in His love. Let God choose your path. He will always choose the right one for you. I hope that it leads to a birthday cake! Happy Birthday. Only one person loves you more than me, and He loved you even before you were born. God loves you so much that he made the earth revolve around the sun so that you could be a year older and celebrate a birthday. Happy Birthday! May God continue to guide you on your path & bless you through your years. God knew you even before you were born and He loves you. Let’s celebrate God’s plan for your life on your birthday, the day it all started. Although your body is growing older, you can look forward to getting your new and perfect heavenly body some day. Today and throughout every season, may God’s grace give you every possible reason to smile, to enjoy and to celebrate. The soul ages with grace when it belongs to our righteous savior. Our creator made us so that we age for a reason. Maybe we will find out why when we get to heaven. May God pour his love and warmth on you wherever you go and in all walks of life. Happy Birthday! Happy Birthday! I hope that God will watch over you and continue to bless and increase his grace upon your life. We are all special in God’s sight, but you make it extra easy to be seen with all those candles on your birthday cake! I am glad that you are adding one more! What’s another year in the life of an everlasting being? Only your body has aged another year. Did you rest with God on the 7th day of creation? You were around back then, weren’t you? Mark Twain said to go Heaven for the climate, Hell for the company. I suggest you get some birthday cake first. Happy Birthday. As amazing of a person as you are, God gets the glory. He allowed you to be born. It’s His love that is easily seen poured out on the lives you touch. Make it your goal is to live each day to the fullest and tmake sure to honor God and always be an encouragement to others. What the future holds for you is firmly in God’s hands. Happy Birthday! Happy birthday my angel. I wish you an amazing birthday. May God Bless you!! How blessed I am to have a friend like you. Stay just the way you are. You make GOD smile. Happy Birthday. It’s your birthday and I can’t be there but I’ll send you a special birthday wish and a little prayer. One more year of life means one more year of an opportunity to help someone in need. Don’t ever forget that. 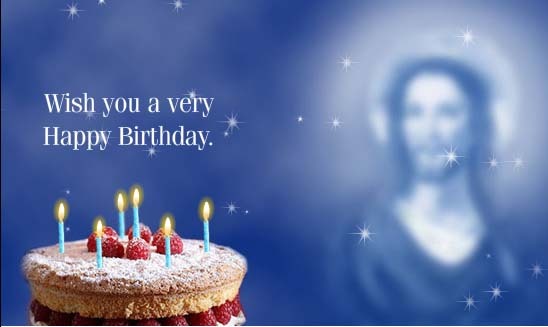 May you have a Blessed Birthday! May God bless you on your birthday and everyday in every way. Happy Birthday. May God bless you in every angle and bring joy to your life and protect you from evil. It is a big day today. God holds you in the palm of his hand, but in the other he has a slice of birthday cake! My wish is that God continue to pour out his blessing and anoint your life! Be ready. Happy Birthday! May God grant you the lungs of Hercules to blow out all those candles on your cake. Here’s to another year of blessings! When God made you He did so with a purpose and plan. He saw all your days before you lived one of them. Happy Birthday. My prayer for you on your birthday is that you be given a spirit of lasting joy which can only come from the Lord. That’s so much better than just a happy birthday. Blessings from our Lord can come any day, but I especially like to give you a blessing on your birthday. On your birthday may God grant all your heart’s desires. May God bless you continue to lead, guide, & protect your life. Happy Birthday!